Great Lakes Today asked environmental groups and others for their thoughts on 2017 — and what’s to come in the new year. One issue stood out: the wide gap between regional interests and the Trump administration. 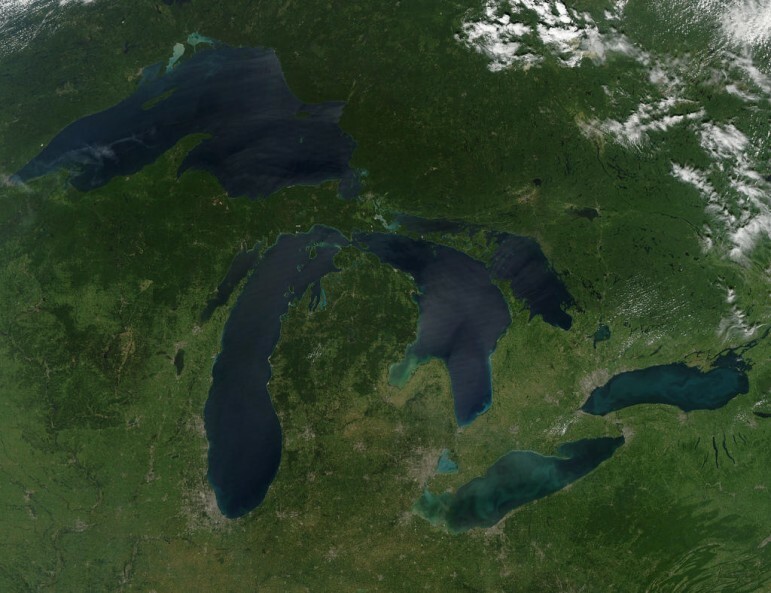 The administration’s threat to cut $300 million in Great Lakes funding was one of the biggest stories of 2017, according to environmental groups. But it also led to the environmentalists’ best moment of the year, too. Responding to the threat, Congress and communities banded together to show their bi-partisan support, and the funding was restored in the federal budget. Jim Ridge of Share the River said the renewed community interest was reminiscent of the response to the Cleveland’s Cuyahoga River fire back in 1969. “Americans (both individuals and grass roots organizations) decided their natural resources were worth fighting for,” he said. The year also brought some personally memorable moments – Alliance for the Great Lakes’ Joel Brammeier said that for the first time, his children asked to hike at Michigan’s Sleeping Bear Dunes. And Mike Ferner of Advocates for a Clean Lake Erie chose a moment in late September, when he dumped Lake Erie’s green water and dead fish in a downtown Toledo fountain. Prairie Rivers Network’s Robert Hirschfeld called 2017 a “full year of Asian carp,” between the delayed release of an Army Corps study on the invasive species and a live discovery of an Asian carp 9 miles from Lake Michigan. Minnesota Sea Grant noted the Oct. 24 storm on Lake Superior that caused the largest recorded wave — nearly 29 feet tall — on the Great Lakes. They also noted the first crude oil symposium, which brought representatives from Canada and the U.S. to Cleveland to discuss crude oil transportation. Asked about their concerns for 2018, environmental advocates mentioned short-sighted officials, bad laws and politically motivated decisions. Minnesota Sea Grant educators also worry about the effects of climate change — the ice cover decreasing every year, while severe storms increase. Ferner hopes to see more work done to address agriculture’s impact on water quality in western Lake Erie. Representatives from Milwaukee Riverkeeper wonder how cuts to the EPA and other federal agencies will affect projects funded by the $300 million Great Lakes Restoration Initiative. Ohio Sea Grant note a possible reduction in funds needed to support monitoring for Lake Erie. Ridge will be watching the growing campaign to rename the Rust Belt the “Water Belt”. When it comes to water quality and affordability, Brammeier wants the region to address a fundamental disconnect. How, he asks, can clean, affordable water be a concern for folks living along “20% of the world’s fresh surface water”? He added, “Smart regions don’t take the kind of risks we are taking. In Michigan farmers are enc0uraged to use sustainable farming methods that protect the water. However, in many cases, they are not required to use these best practices, they need to be required . It is unconscionable that the waters of Lake Erie and the health of thousands of people have been severally compromised because some are not making the effort to change their methods, and rules and regulations are so inadequate. We must all live up to the challenge of becoming aware and implementing the acquired community knowledge. Home owners with golf course lawns included. In spite of the fact there is great ice cover on Lake Erie which could save it, that won’t happen because of the N.Y.P.A. ice boom. Also because the I.J.C. is a spineless and indifferent organization that sits back and does nothing of value. So I predict Lake Erie will have another record setting year of algae and botulism outbreaks as well as massive dead zones. Enjoy your Summer! Google Joe Barrett Ice Boom for the truth.